I still love my Early 2011 17″ MacBook Pro, as do many others despite its potential to exhibit a known graphics fault (see Apple Recall regarding discrete GPU failure), and it continues to be my daily driver and likely will remain that way for the next 4-6 years – unless Apple decides to reverse its course on a few decisions and bring back its old flagship model. For now, my 2011 is still plenty powerful for daily needs and to this day can match the speed and power of many modern portables thanks to its quad-core i7 and SATA Rev. 3 architecture. I could ramble on and on and contradict various arguments surrounding reasons why Apple discontinued the 17″ MacBook Pro in favor of sticking with 15″ Retina models and the 13″ non-Retina model as its lineup, but I’ll instead speculate that “what was old will once again be new someday”, just as it was with the 12″ form factor and consumer MacBook moniker. Why speculate on the notion of the return of the large screen portable at this point? Haven’t people just moved on and let go of the idea? The introduction of the Apple Pencil: with the new availability of the iPad Pro with the optional Apple Pencil, a large 17″ canvas running OS X El Capitan that could take advantage of the same technology could make for a great all-purpose creator’s tool. The case size of the 17″ MacBook Pro would give Apple engineers plenty of space to carve out room to insert the stylus somewhere, making the layout seamless and elegant. 4k display prices are becoming reasonable: It would only be natural to make the 17″ have a full 4k 16:10/16:9 (3840 x 2400/3840 x 2160) native panel for the absolute largest media creation and consumption space for whatever your heart desires, although it would be wise to ensure that other various resolutions such as 1920 x 1200/1920 x 1080, 1680 x 1050 or even 1280 x 800/1280 x 720 could all work nicely to keep things easy on the eyes for those with vision impairments who just desire more space and bigger icons. The 4k panels are now at affordable prices, with larger 28″ to 34″ desktop screens now found at prices as low as $500. A 17″ panel proportionally should cost around $250 to $300 at retail, meaning that at cost, it’s not the hurdle it once was. Video/Photo Enthusiasts miss it: The 17″ with its larger canvas tends to work better for video and photo editing. The extra 2″ of diagonal translates to roughly 30% more space to craft your visions, dreams, and realities and will allow for next generation movie watching on the go. Lots of enthusiasts in these fields have hung onto their 17″ 2011 machines for this exact reason and have maxed them out with fast SSDs, 16 GB of RAM, and Blu-ray drives. Speaking of Blu-ray, by bringing back the 17″, it may also provide a launching point for the next generation optical media, despite’s Apple’s assumption that the medium is dead. As much as I love digital copies for their convenience, physical media is still king in my humble opinion, as it’s a tangible, tradable good. Perhaps a partnership with Sony to use BDXL and their rumored 1 TB optical disc in development is not far-fetched at this point, given the fact that Sony has let go of their own Vaio line of notebooks. 4k content needs way too much bandwidth to be feasible on the go in networks outside of major metro areas (let alone 1080p in many instances), making physical media still viable. A new 17″ would be the perfect place to provide these options, as fans of Apple gear have traditionally regarded the 17″ as Apple’s top of the line premium product for mobile computing. Gamers – Apple and Sony (if partnered on an optical drive) could also potentially market the 17″ MacBook Pro as a gamer’s laptop by integrating PS4 disc playback on the go through PS4 emulation or by adding some minor hardware tweaks to allow it (such as integrating the PS4 graphics and memory system that could be switched between when PS4 media is played). You could have an onboard GPU for the Mac, while switching to the same discrete GPU with GDDR5 unified VRAM for PS4 gaming and other media, making code execution for those applications simple and seamless. The other approach could be simply providing a Remote Play client to Apple to stream from the PS4 console itself. Let’s face it; Apple has tried and tried, but it may never shatter through the “core gamer” conventional barrier like Microsoft did with the XBox. A partnership with Sony could be just the thing both companies need. As a segue, an Apple/Sony partnership to some extent on a 17″ MacBook Pro could also in hand save Sony’s flagging handheld business. I love my Vita, but Sony has been missing the boat on mobile gaming due to not grabbing enough of the mainstream market this time (it was far more successful with its predecessor, the PSP). Nintendo regardless has a stranglehold on the handheld market and is definitely not letting go. Perhaps a partnership with Apple on a next generation 17″ MacBook Pro could also allow the Vita through a firmware update (or a future handheld with both physical and digital media distribution) to become another source for iTunes media? It’s perfect companion to pair it with on the go while away from the PS4 could be the 17″ MacBook Pro. Science/Engineering Community – Another couple of fields that love their 17″ machines; scientists and engineers also tend to like the extra space. Whether it be for another window to monitor something, another window to be messing with code, while having two different VMs open at the same time, the extra space again makes a big difference. 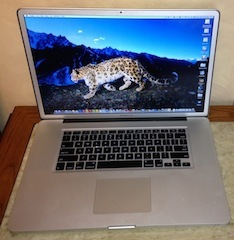 The loss of the 17″ MacBook Pro has undoubtedly sent many of them looking elsewhere for a large notebook. Business Users – Corporate execs might love their iPads for daily use, but when looking at large spreadsheets, budgets, etc., nothing compares to what the 17″ offers. The resounding theme again is space. More space = more to see at once without zooming in or squinting = greater efficiency when running through any various analytics. The 15″ Retina might be easier to tote around, but in this case, more is more. I refuse to believe that Apple only cares about the consumer market these days as reasoning why the 17″ MacBook Pro disappeared. Indeed Apple has scaled back their Pro Apps, but still were classy enough to give us a modern Mac Pro. It’s high time they did the same with their old flagship and bring back the 17″ MacBook Pro. They don’t necessarily have to be the source of creative applications anymore, but darn it, give us the hardware. Base configuration with this proposed next generation product would likely start at $2799 and range up to $4999. One can only dream, but a next generation ultimate 17″ with all the fixings such as my proposed setup along with giving back upgrade paths to the portable line (at least on this high-end) would certainly be everything that power users/gamers, creative types, high-end business professionals and the science/engineering community have always wanted. The market is ripe with desire. Will Apple provide the goods?